These Caribbean private catamarans deserves to be placed on pedestals, because over the last decade they have become the sailing vacation choice of many yacht charterers. We grade our teams, on gorgeous service, presentable happy professional captains-crew, and world class cuisine, the quality of their respective yachts, what water toys they carry on board, and how they provide gracious fun living for our clients. The slightest advantage they show above their competitors means the higher up the ratings they climb. To see some of the best Caribbean catamarans in the industry today please click on any of the links below. Luxury Catamarans The second major decision after selecting your location for you yacht charter vacation, is what type of craft? The modern Caribbean catamarans are stable and spacious, which compliments the protected lagoons. The demand for these types of comfortable Caribbean catamarans has blown across the industry like a wild prairie fire burning out of control. 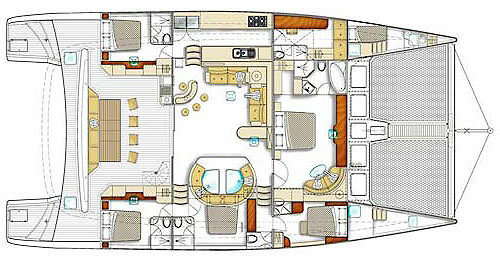 The main reason is comfort, space, magnificent stability, privacy and elegance with equal cabins for all. The catamarans have single-handily taken the comfort level on the sea to a higher plain, more stable than sailboats and power yachts! With this combination you are assured of a magnificent vacation. No crowds, go wherever you like, when you like, no regimental times to stick to, you set the pace. Your charter broker is your original guide but your captain will execute your final plan.